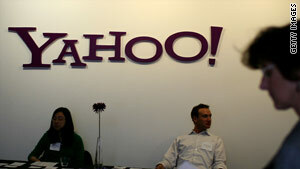 Yahoo, which plans to launch three new blogs, is one of many companies competing in online news. (CNN) -- As countless print- or TV-based news organizations continue their descent, the future of the news business still seems curiously bright. Just sniff around online for a look at the multitude of startups and internet giants throwing their bets on the table. Yahoo, one Web behemoth, plans to add three new blogs to its growing family on Monday. Yahoo's network expansion was born from a 7-month-old venture called The Upshot. For this blog covering breaking news and analysis, Yahoo recruited several seasoned journalists. The new properties will live under The Upshot brand, but each take their own names -- The Ticket for politics, The Lookout for national affairs, and The Cutline for media industry coverage. At the helm of the project is Andrew Golis, a 27-year-old who came from Talking Points Memo, an online-only news network. There, Golis helped steer a rocket ship of a news startup at a time when there was little assurance that the Web needed or wanted another news source. Now, here he is again, helping to launch another news brand. "On one hand, it is a very crowded space," Golis said of the news industry. "On the other hand, I think we're actually fairly early in the shift to digital." There's a lot of noise on the Web, but Yahoo says it has unique attributes that will help it stand out. In addition to a strong team that includes veterans of the Washington Post, Politico and Gawker Media, the 15-year-old Sunnyvale, California, internet company outfits its journalists with tools that analyze search trends and other data from Yahoo visitors. While helpful, reporters are discouraged from leaning too heavily on those tools, Golis said. "It's an asset that we have to help us understand what will resonate," he said, but, "it doesn't function as an assignment editor." Yahoo operates one of the most-visited news websites, according to research firm ComScore. The Upshot accounts for more than a third of the Yahoo News audience, drawing 30 million visitors a month, according to Yahoo's own traffic reports. Yahoo News (The Upshot excluded) is centered around syndicated articles from The Associated Press, Reuters and others. But just because Yahoo is ramping up efforts to produce more of its own content, don't expect the writing to take a partisan approach, said Golis and his boss. "Because we rely largely on aggregation," said Mark Walker, head of Yahoo News, "Yahoo has a strong reputation for offering a very balanced view." "Pure aggregation will only get you so far, even if you're really good at it," Walker said. He talked about using original reporting as a way to "differentiate" from the multitude of websites offering up wire stories. "I think this is the most focused and largest effort that we've had in terms of original content," Walker said. The strategy also includes video productions -- a key to rival AOL's recent refocusing. Yahoo may have a leg up on traditional news companies, which are "inventing new businesses while their legacy business struggles," Golis said. Yahoo "does not have a legacy business to worry about," he said. Yahoo has ceded Web search, an area where the corporate name does carry a legacy, to partner Microsoft. The joint venture with Bing is a strategic move to level the playing field with Google, Raymie Stata, Yahoo's chief technology officer, said in a fireside chat at a conference this week. The health of Yahoo's business came into question Thursday amid rumors of staff cuts. Perhaps an indication that editorial is an attractive growth area for Yahoo, Walker said he has no concerns about the future of his division -- though, it has no immediate plans to ramp up hiring, he said. A team of nine Yahoo News reporters and editors, who contribute to The Upshot, will staff the new blogs. "I don't see us ever hiring the number of reporters as, say, the New York Times or the Washington Post," Walker said, "because that's not really where Yahoo News lives." In reality, the company that claims to be the biggest hirer of full-time journalists is neither of those. AOL, in expanding its hyper-local news project called Patch, says it plans to hire 500 reporters this year. It recently acquired the technology blog TechCrunch. "Our turnaround strategy is hinged on content," said David Eun, president of AOL Media. "Across the company, we are betting on content." "They're making a clear statement," Sree Sreenivasan, a professor at the Columbia Graduate School of Journalism, said of AOL and Yahoo. "Journalism counts." Web-only news properties garner significant attention from investors. Broker interest in the Huffington Post and TechCrunch (before it was acquired) was very high earlier this year on SecondMarket, a website that facilitates the sale of private stock, according to that company's quarterly report. "It's not surprising that all this investment is happening in this area and all this growth," Sreenivasan said. "Despite what we hear about traditional media, there is now more media being produced and consumed than ever before."